Cooler GPU temps. Your room temperature will stay the same whether you run the fan at 20% or 100%, since the same amount of heat is being produced by the card regardless of the fan speed. You don't measure temperatures by C... you measure by W/hr or similar. C is absolute temperature. W/hr is not a real unit, and temperatures are measured in degrees Celsius (or in Kelvin if you go by SI units). Watts are a measurement of power or heat, which is not the same thing as temperature. In any case, you can't compare a 95C GTX480 to a 95C 4850/8800GT and say they both produce the same amount of heat. You measure the heat output in watts. Once again...do you loop Furmark all day long...? or just play some games, check email and surf HWC? So....you won't be blasing 95c air into your room all day long. Perhaps not 20c, but most certainly 15c cooler with the an jacked up to 80%.......we'll see soon enough when some folks start getting thier mitts on these Cards....based on Sky's numbers and my experience with Multi 280's, I would expect to see 85c - 90c range running Furmark with Fan sped at around 80% - 90%......but who the heck plays Furmark? So you want to turn up the fan speed on your future GTX 480 EH. I don't think it will help much. We fired up FurMark and ran the stability at 640x480, which was enough to put the GPU at 100% load in order to get the highest load temperature possible. This application also charted the temperature results so you can see how the temperature rises and levels off, which is very nice. The GeForce GTX 480 maxed out at 96C. 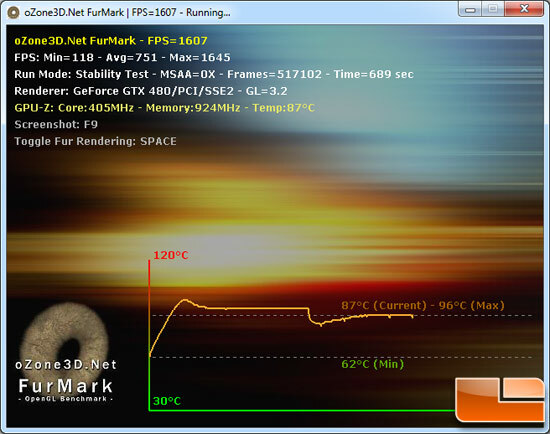 The fan on the GeForce GTX 480 video card was left on auto during temperature testing and the fan speed is dynamic. This means that it will increase/decrease depending on the GPU temp and GPU load. You can see a slight dip in temperatures at the start of the test as the GPU fan was still spinning up to a higher speed to keep up with all the heat. The card peaked at 96C then the fan speed increase was able to cool the card down and keep the temperature level at around 92C. The CPU Fan peaked at around 88%, which meant the Delta cooling fan was spinning at ~4500RPM. When we hit the space bar to stop the rendering the temperature dropped, but since a 2D application was open the card wouldn't go back to a complete idle state. Since the fan then slowed down again and the temperature started to rise again. I do not think turning up your fan to 90% will help you much. Last edited by Silvgearx; April 7, 2010 at 07:11 PM. out of curiosity, do you think youd have issues with rma if you were to leave furmark on and see what happens with the card at 90+c 24/7? stock everything, fan profile and what not. I think they would cover it. I know some people have reviewed with SLI and even TRI SLI and the temp stayed the same at mid 90's for furmark load.